To download 2nd Quarter 2014 Newsletter, CLICK HERE! Still slim pickins'! Across the board throughout all Boulder County communities and covering both detached homes & condos/townhomes, the number of properties for sale is down modestly year over year, but significantly down since 2010. 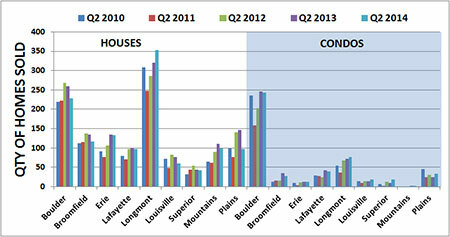 In fact there are almost 50% less Boulder hems for sale this year compared to 2010 & 2011 2nd quarter. Simply said, there is less for sale throughout all of Boulder County this year. There is not an anticipation for significantly more inventory for sale over the next 2 quarters of the year, as we are now past our peak sales season and even new construction projects will not keep up with the buyer demand. Less sales! Overall we are seeing a noticeable trend of less successful sales this year compared to 2013. This is largely due to simply less properties for sale and the inventory crunch than buyers not buying. Boulder-specific homes sales are down (7.7%) this year compared to last as an example of limited inventory (1,227 sold 2014 vs. 1,329 sold in 2013). Hustlin'! With such limited inventory, the speed of the market has maintained a fast pace with low days on market. Boulder condos/townhomes have actually outpaced Boulder houses overall. While Louisville and Superior houses have outpaced Boulder houses also. Overall all properties are experiencing less days on market this year compared to 2011 & 2012. It is also worth noting that 2nd quarter is indeed the "peak selling season" so properties do move fastest this time of year throughout all market areas. Prices are climbing! There is a noticeable upward trend in average sold prices across Boulder County community homes sales specifically, with less so of an upward trend (maintaining value) in condo/townhome sales. Boulder houses averaged $800,000+ in sold prices for the 2nd quarter 2014. while condos/townhomes averaged $300,000+ in sold prices. 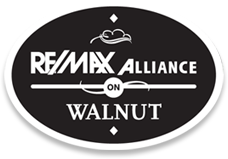 Buyer demand, with limited inventory is driving these prices upward and we can continue to anticipate increases in average sold prices. Noticeable appreciation & equity gains! Every single Boulder County community has seen increases in median sold prices of homes in the 2nd quarter of 2014 vs. 2013 and definitely since 2010. Boulder-specific homes median sold price is now $700,000.There is also a sharp increase in Lafayette-specific home values as well compared to 2013. While Boulder County condos/townhomes sold median values have largely maintained values this year compared to 2013, with Louisville condos/townhomes seeing the biggest increase in values. NEW LISTING - 185 2nd. Avenue #A, Lyons!